I Have a HP Photosmart Premium printer fitted with 5 cartridges (4 thinner ones and 1 fat one). I wish to buy:- 1 x thin 364XL black plus a full set of 4 x thin 364XL and 1 x fat 364XL. Does the pack of 4 include the fat black or the thin black please? Hope this makes sense. What combination do I have to purchase please? Please note that although the cartridges are all HP 364XL, Hewlett Packard have stopped production of the wider black cartridge (CB321EE) and replaced it with the smaller (CN684EE). This is the standard black cartridge contained in our multipack. We only sell the high capacity photo black HP 364XL ink cartridge as a separate item. Hi, do you sell any good quality compatible inks for the HP 364 Photosmart Premium printer. I would prefer a multipack or, failing this, what is the best price available on the genuine multipack for this printer? Many thanks, Louise Sheppard. Thanks for your enquiry. We're now supplying top quality compatible HP Photosmart Premium All-in-one ink cartridges. These premium brand ink cartridges can be purchased individually or In multipacks. Please see above. With many online stores selling HP Photosmart Premium all-in-one inks, it can be difficult choosing the right one. Cartridge Save offer a price promise that offers peace of mind that you're getting excellent value for money. Our range of genuine and compatible products gives you the option which suits you best and if you are unsure which to choose, our award winning customer support team are on hand to help you make that decision. Order your HP Photosmart Premium All-In-One ink here at Cartridge Save and you'll be able make huge savings! Totally free delivery comes as a piece of the package with each order whenever you purchase discounted HP ink here with Cartridge Save. All HP Photosmart Premium All-In-One print supplies ordered at Cartridge Save always are protected with our money-back assurance. The main selling point of HP's Photosmart Premium All-In-One is its smart touch screen – a big leap from previous Photosmart models. It prints up to 33ppm in black and 32ppm in colour, and has a maximum scanning resolution of 4800x4800 dpi. 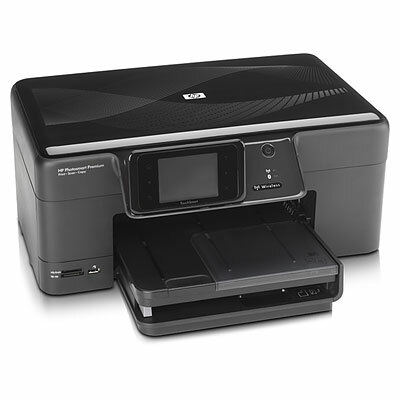 Expect fine prints, accurate scans, and reproductions at blazing speeds. The Photosmart Premium All-In-One is an energy-efficient scanner, printer and copier in one, with the added bonus of Snapfish support and more flexible connectivity. The device still does not have an automatic feeder for copies, and the wireless system takes time to stabilize. The Photosmart Premium All-In-One boasts standard Bluetooth and Ethernet support –something that older Photosmart versions lack. It allows wireless printing and features an intuitive touch screen panel (3.5") for accessing menus and options. The media tray can handle a good variety of paper types and sizes. The Photosmart Premium All-In-One is approximately 452x473x199mm – the perfect size for desktops. The Photosmart Premium All-In-One has the usual multiple memory card slots to allow PC-less printing. Flexible connectivity means Bluetooth, Ethernet, USB, and 802.11n Wi-Fi options. It is also capable of automatic two-sided printing. Although the wireless set-up process is simple, the Photosmart Premium All-In-One's system can take a while to stabilize. Some users have reported problems with the touch screen (very rare). The automatic media sensor is a little unreliable, causing error when printing labels.